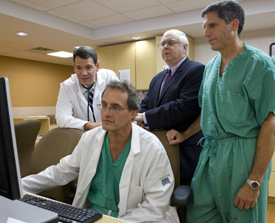 The Division of Vascular and Endovascular Surgery at Montefiore Medical Center has a proven history of developing and perfecting treatments for all disorders of the vascular system, including abdominal and thoracic aortic aneurysms, carotid artery disease, lower extremity peripheral arterial disease (PAD), varicose veins, and renal artery stenosis. A leader in the field, we are a high-volume program that has played a significant role in the growth of vascular surgery, having pioneered, developed and perfected numerous techniques for the treatment of patients with peripheral vascular disease. The first endovascular abdominal aortic aneurysm (AAA) repair performed in the United States was performed at Montefiore almost two decades ago. Clinical excellence, educational leadership and technical innovation are marks of distinction for the vascular surgery program at the Montefiore Einstein Heart and Vascular Center. Patients with peripheral vascular disease often have complex medical issues and benefit from this comprehensive approach to treatment. Our internationally recognized staff includes vascular surgeons, vascular technologists, physician assistants and nurses, all specially trained — as individuals and as a team — in the latest technologies. We care for our patients with a multidisciplinary approach, working closely with other specialties including cardiology, nephrology, neurology, neurosurgery, orthopedics and urology. Our division remains at the forefront of virtually every aspect of vascular disease treatment, focusing on advanced ways to use minimally invasive methods whenever possible through clinical trials and studies. The majority of our patients are treated with endovascular or catheter-based procedures, providing a minimally invasive approach that can reduce the complications associated with traditional open surgery. The division's non-invasive diagnostic vascular laboratory offers a full range of options for all vascular disorders. Here, Montefiore's vascular surgeons and technologists employ the latest treatment and imaging technology to provide the high-precision care that patients require. On average, more than 22,000 studies are performed in Montefiore's ICAVL-accredited labs each year, making it one of the busiest in the region. Montefiore's vascular surgery fellowship program was among the first in the nation to be approved by the American Association of Medical Colleges. The program continues to train aspiring clinicians from around the country and sponsors visiting scholars from around the world. The division provides training in vascular diseases for medical students, surgical residents, and vascular fellowship trainees alike. Research and development play a dominant role in the ongoing success of Montefiore's vascular surgery program. The initial experience in the United States with endovascular aneurysm repair utilized the surgeon-made Montefiore Endograft system. As an active participant in many groundbreaking endograft trials, Montefiore continues to have a hand in advancing this innovative care.